Colors are the insignia, or "patches", worn by motorcycle club members on cut-offs to identify membership of their club and territorial location. Club patches have been worn by many different groups but, since the 1960s, have become largely synonymous with outlaw bikers. They are regarded by many to symbolize an elite amongst motorcyclists and the style has been widely copied by other subcultures and commercialized. Colors are considered to represent "significant markers of the socialization" of new members to clubs, rank and present a dominant symbol of identity and marked with related symbolism. They can be embroidered patches sewn onto clothing or stenciled in paint, the primary symbol being the "back-patch" of club's insignia or logo and generally remain the property of the club. Wearing such clothing is referred to as "flying one's colors". Colors identify the rank of members within clubs from new members, from "prospects" to full members known as "patch-holders", and usually consist of a top and bottom circumferential badge called a "rocker" stating the club name and location, and a central logo of the club's insignia, with a fourth, smaller badge carrying the acronym "MC" standing for "Motorcycle Club". They are used to create social bond and boundaries and, generally, belong to the clubs involved rather than the individual wearing them. The wearing of them can often lead individuals to be refused service at related businesses and bars. Many motorcyclists wearing colors are from "family oriented" motorcycling clubs chartered by the American Motorcyclist Association and wear one-piece patches to differentiate themselves from three piece patches of outlaw bikers. These generally do not state a territorial location. The motorcycle manufacturer Harley-Davidson notably adopted the style in its branding and community-building effort, the Harley Owners Group. The term has its roots in military history. As with outlaw motorcycle clubs visual identification of a member of an club is indicated by a specific large club patch or set of patches usually located in the middle of the back of a vest or jacket. The patch(es) may contain a club logo, the name of the club and other chapter identification. In most motorcycle clubs the patch representing membership in the organization is often referred to as “the club colors” or simply “the colors”. Each club has rules on how the colors are treated and when it is proper to wear them. Well structured clubs have bylaws dictating the behavior of its members and thus the proper use of their colors. Tattoos may also come under the category of club colors. 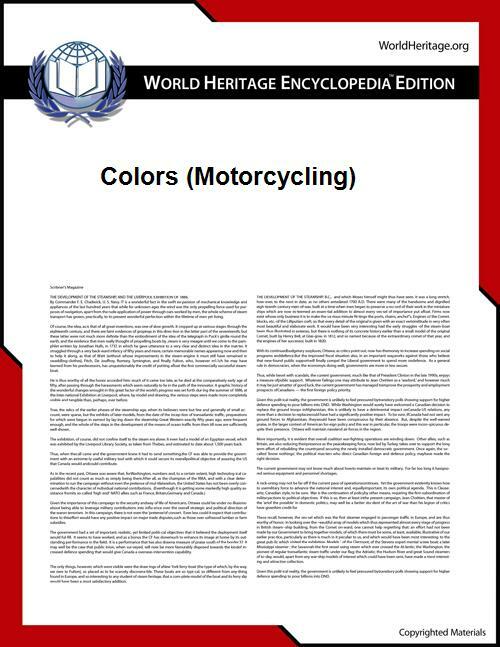 Commons has media related to Motorcycle club colors.